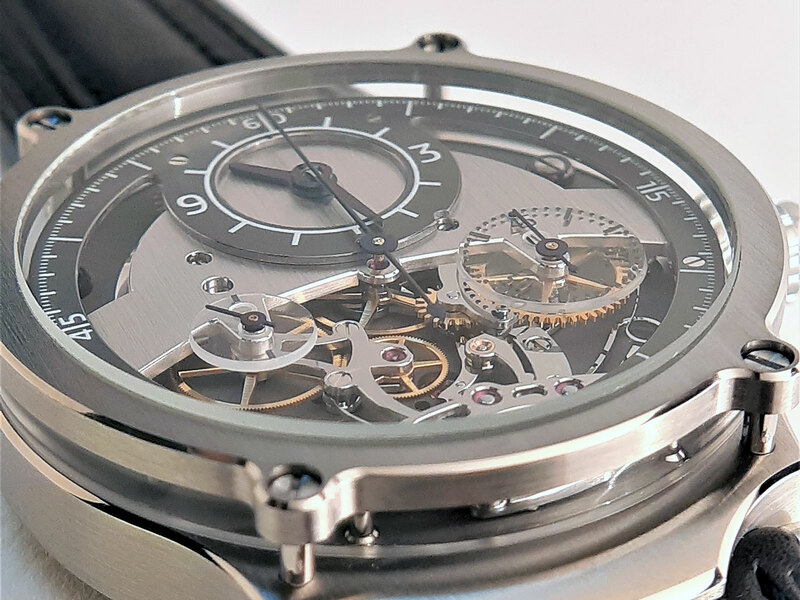 A young French watchmaker who recently settled in Sainte-Croix, Switzerland, to start a career as an independent watchmaker, Sylvain Pinaud has just completed his first wristwatch, a single-button chronograph with the chronograph works exposed on the dial. It’s an unusual, interesting, albeit pricey, watch. Mr Pinaud is the son of a watchmaker, and formerly worked for Dominique Mouret, a Swiss clockmaker specialised in the restoration of antique timekeepers. Just over a year ago he struck out on his own, and started work on the Monopoussoir Chronograph. The watch was conceived as his entry into the 26th Un des Meilleurs Ouvriers de France. It’s a prestigious, national competition in France for craftsmen in numerous categories, from pastry making to marquetry. 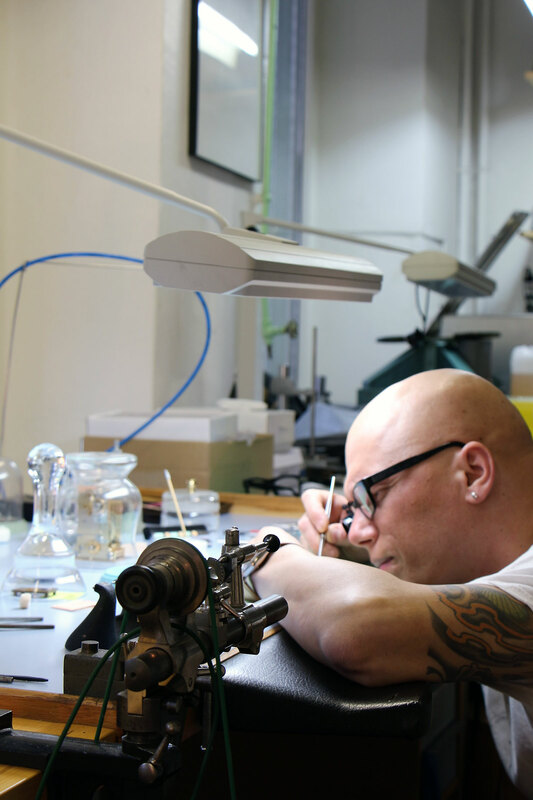 Mr Pinaud won in the category of “restoration watchmaker”, and is the only watchmaker amongst all the winners, who will receive their prize in May 2019. 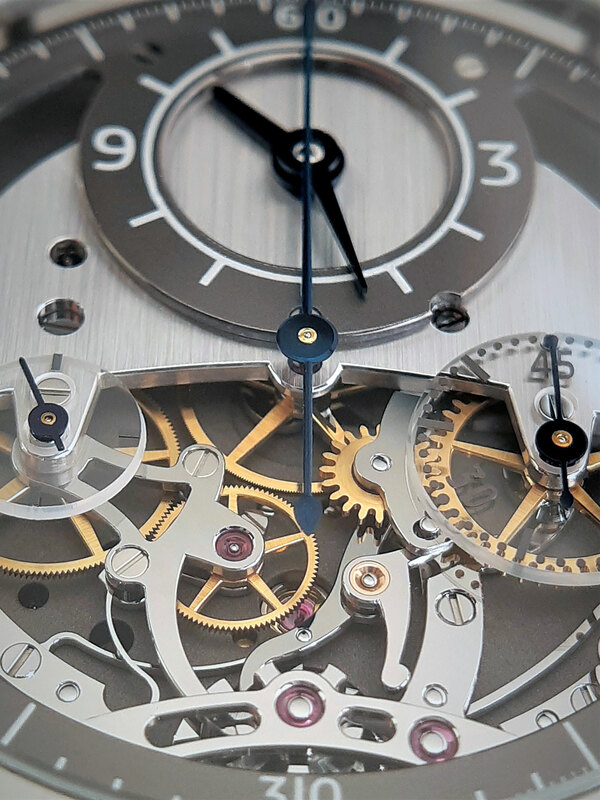 The Monopoussoir Chronograph – which translate as “monopusher chronograph” – utilises the gear train and escapement of the ETA Unitas 6497, while Mr Pinaud makes the bridges, base plate, keyless works and balance. According to Mr Pinaud, most of the parts were hand-made the traditional way, in other words with a lathe or saw. 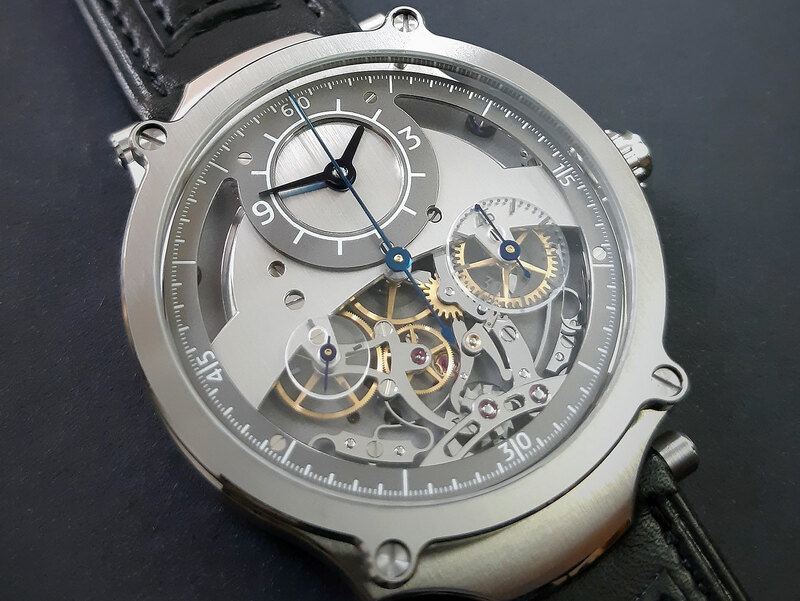 The movement is hand-wound and has a 45-hour power reserve. 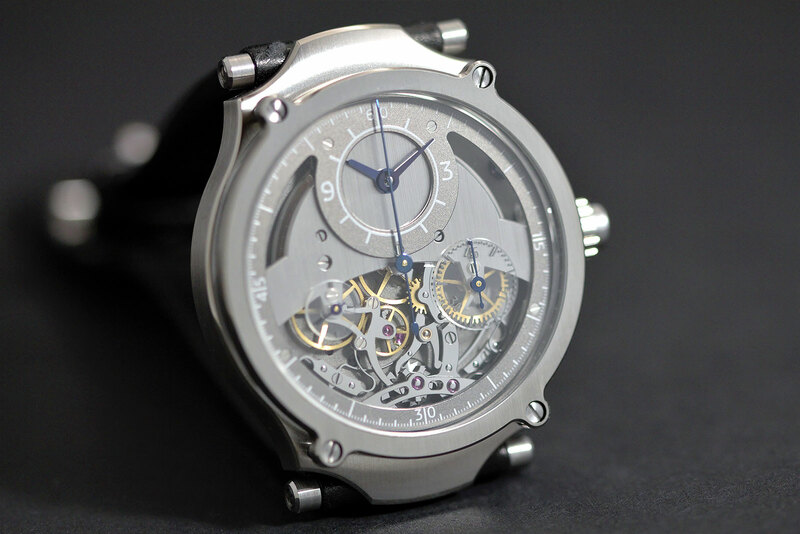 The chronograph is constructed traditionally, with a column wheel and horizontal coupling. Unusually the mechanism is exposed on the dial. Time is indicated on a sub-dial at 12 o’clock, with the chronograph counters at three and nine on sapphire sub-dials. The sub-dial at nine is for the constant seconds, while the sub-dial at three is the semi-instantaneous for elapsed minutes. The case pictured is titanium, 42mm in diameter and 12.5mm high, though it is also available in 18k red gold. While Mr Pinaud has ideas in mind to further develop this movement, perhaps by adding a power reserve mechanism or unusual date indication, that is for the long term. 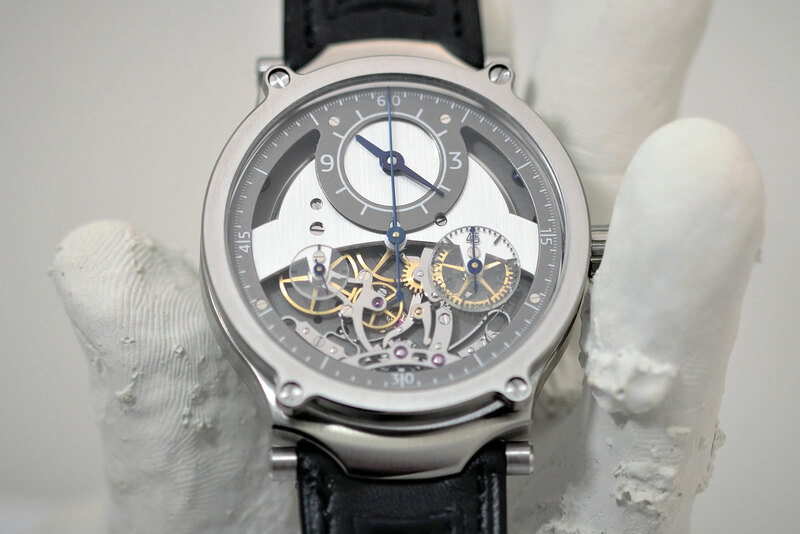 Right now he will focus solely on the Monopoussoir Chronograph, and also on a handful of projects he is working on in collaboration with other watchmakers. 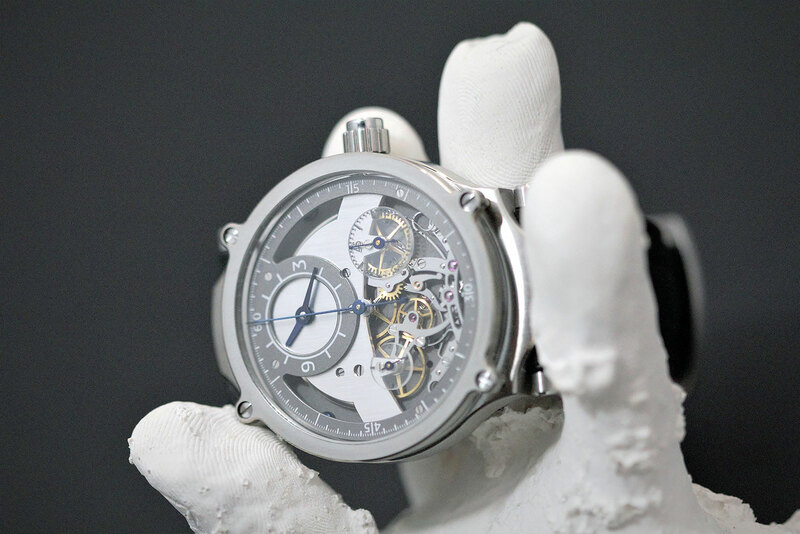 The Monopoussoir Chronograph is priced at SFr78,000 in titanium and SFr88,000 in gold, excluding taxes. It’s available direct from Mr Pinaud.